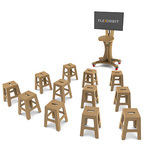 The FLEXHIBIT platform is easily updated and renewed with minimal effort and expense, making the exhibits affordable and sustainable while offering users new experiences. 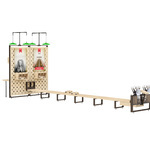 Additionally, the platform itself is designed to setup in a variety of configurations to make effective use of available space. Each platform can be configured to host any number of interactives, and can be tailored to fit the look and feel of your exhibit space. We also offer accessories like seating, task lighting and storage to further tailor the exhibit for your needs. Grab a car off the shelf, customize it for speed and experience Sir Isaac Newton’s Third Law of Motion first hand while racing a friend to the finish line! 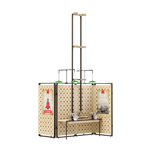 Air Rocket users can choose a rocket or build their own, place it on the launch pad and experience Sir Isaac Newton’s First Law of Motion first hand! This augmented reality sandbox allows users to physically create real-time topography complete with water flow and rain simulation. A 3-D projector creates contour lines of the sand allowing users to recreate certain features to see how water flows and affects the land, stream beds and watersheds. Suspend light-weight spheres in mid-air while learning how something as heavy as a jumbo jet is able to fly as though it’s lighter than air! See the Bernoulli Principle in action! Suspend light-weight spheres in mid-air while learning how something as heavy as a jumbo jet is able to fly as though it’s lighter than air! Connect a maze of circuits to complete a connection with the device you want to power. It's our take on snap circuit. No external power required! 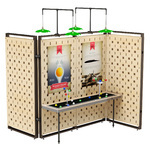 Users can experience and learn about the 4 basic principles of magnets with this exhibit. Photoelasticity is used to determine the distribution of stress in a material. It is commonly used when the mathematical solutions get tricky or overly complex. We wanted a STEM based exhibit that would be hands on to allow children to explore the stress distribution of bridges. 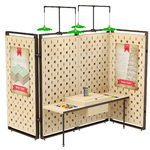 Pop Up Classroom Pop Up Classroom Create fun, goal focused activities to stimulate learning with a quick FLEXHIBIT Pop-Up Classroom. Crank a generator to charge the capacitors that launch the ring. Experiment with different ring sizes, weights and designs to achieve new results. 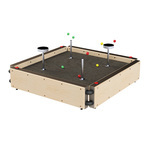 This shake table exhibit allows users to explore the effects of vibration on physical structures. 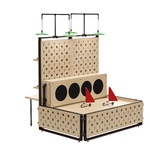 By changing the frequency of vibration, users are able to find harmonic frequencies within their own structures and explore options to increase a structure's ability to withstand vibration. Steel, rubber or spring loaded tensioning bar. Select a material to test the strengths of each one and decide which will work for your bridge or other building project. All of the sailing, none of the water! Did you know the best angle to sail into the wind is at 45°? The vessel must zig-zag, or “tack”, from starboard to port to reach a destination from which the wind is blowing. Up, up and away! As the objects enter the air column, notice how different versions react to the same amount of force from the air. 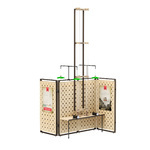 Working to build a wind tunnel that will allow children to test airflow over various shapes and other surfaces. Without adult supervision. info@flexhibit.comCopyright 2017 all rights reserved.